The new Miele washer dryer models are full of stunning features and intuitive design upgrades that you will love. The Miele washing machine and the heat-pump dryer are centered around Miele’s core goal of caring for your fabrics no matter how delicate, heavy duty, or unique. The W1/T1 line washer and dryer models continue Miele's commitment to quality and are designed from the ground up to hold up to 20 years of regular use, a figure that doubles the ten year expected life of nearly every other manufacturer. (1) Best fabric care - Whites or Colors, you will preserve vibrant colors of your clothes. On top of it, you can smooth wrinkles with the help of steam finish. (2) Miele washers have 1,600 RPM turning speed which extracts more moisture than any other washer. This leads to faster drying and time savings. (3) Thanks to Heat Pump technology, Miele dryers do not release excessive heat and moisture to your room. You can install them in closed door closets. (4) Miele dryers uses 110 volts. This eliminates the need to add a 220-volt outlet to your home. Saves on installation costs, versatile. These Miele washers can be stacked with the matching heat-pump, ventless dryers. You can choose TWF160WP the 17.6 lb capacity, Energy Star model with the white door at $1,499 or the glass door steam dryer TWi180WP at $1,799. The new TWB120WP dryer at $1,199 can also be stacked with any of the washers. We will dive deep on all of these models below. Here’s an in-depth look at the most exciting elements of the new Miele W1 washer and T1 dryer, not least of which is the fact that both the W1s and T1s can operate on 110 volt standard power, an almost unheard-of feature in modern washer and dryer design. Consistent with their heritage, the new Miele washer and dryer are stackable and designed to fit in tight closet spaces. With this unique system, you can store three months’ worth of detergent in your machine. Both UltraPhase1 detergent and UltraPhase2 non-chlorinated bleach are released automatically to eliminate waste and achieve the perfect clean. Similar to steam option found in popular dryers, Miele W1 washers provide steam option. SoftSteam feature kicks in at the end of the wash cycle. It treats fabrics that easily crease (such as linens and certain cotton blends) to reduce wrinkles. WiFi Connect Both the W1 washer and T1 dryer connect to your home network, allowing you to see detergent levels as well as machine performance data right from your smartphone. Intensewash Cycle Guaranteed to give you the highest level cleaning performance, Intensewash is also complemented by Quick Intensewash and Single Item Wash for quick results that don’t sacrifice cleaning quality. 1,600 RPM Motor While not a new addition, this industry-leading quality motor is still the pillar of Miele machines. It cuts down on dry time as more moisture is extracted than in other machines. Automatic Water Level Adjustment W1 machines are capable of automatically adjusting water levels and fill durations based on the load. This is not only great for the environment, but also saves you money on utility bills. Clean Machine Special program that sanitizes and freshens your washer, keeping your investment in top-notch shape. Detergent Flexibility If you elect not to use TwinDos or CapDosing systems, you can use any high-efficiency (HE) detergent in your Miele washer. The dispenser drawer even features additional containers for primary detergent, bleach and softener. Customizable Programs These allow you to set pre-wash times, soak durations and even adjust ideal temperature settings. This becomes handy for high-altitude customers where altitude becomes a factor in washing. EcoFeedback This helps you track your energy and water consumption in order to save you money and protect the environment. The W1 washer line comes in three different units, which we consider to be the good, better and best options in the Miele line. The WWF060WCS offers CapDosing and WiFi connectability, plus the signature Miele 1,600 RPM motor. It also offers 15 unique preset cycles including normal, dress shirts, express, darks and denims, extra white, sportswear, and more. SoftSteam helps with wrinke prevention. This option adds the TwinDos system for automatic detergent and bleach dispensing, plus additional wash cycles for Baby Clothes, Down, Towels and Pillows (19 programs). This top-end entry into the W1 line offers all of the benefits of its predecessors, plus IntenseWash for the highest level cleaning performance and Quick IntenseWash for a fast, thorough clean. It also boasts the SingleWash program for an efficient way to wash an individual garment. One of the most desirable aspects of the new Miele washer line is its Miele Leak Protection System, which protects the entirety of the washing machine and the area surrounding it from water damage during normal operation. Consisting of an inlet hose designed to resist bursting and capable of handling pressures up to 7,000 kPA, an electronic module with drainage and overflow protection, and a ventilation system that ensures the washing machine is never fully emptied, this patented system ensures that you’ll never have to come home to a leak or damaged machine. This system also boasts a built-in sump for collecting water in the base of the machine, plus overflow protection to ensure that the machine never takes on too much water. When the washer detects excess water, a drain pump is automatically activate to safely pump away the extra water. Here are some of the best new and returning features in the 2019 T1 Miele dryer product line. The T1 dryer is the only respected ventless dryer in the USA that operates on standard 120V power. And in the name of straightforward installation, you don’t even need to call an electrician to replace your 220V model. Simply use a NEMA adapter sold by Miele and plugged directly into your wall outlet. This allows you to use the specially formulated Miele fragrances to freshen up your laundry. Simply attach the FragranceDos pod to the holder of your dryer. Interestingly enough, Miele fragrances are produced by South France's MANE family, a dynasty with a rich history of creating fragrances and essential oils since 1871. Removes excessive wrinkles and gets your garments ready for quick ironing. This brilliant technology enables you to save energy and gently dry your garments. In fact, T1 tumble dryers have been designated as the Most Efficient ENERGY STAR certified products for 2019. 17.6lb Max Load Already impressive in its own right, even more impressive is the fact that a load this heavy will still have plenty of room to tumble in the T1’s 4.1 cubic feet drum. The T1 line comes in two models. The TWF160WP features a white door, while the TWI180WP offers a glass door plus Steam Finish and Pillow Dry programs. 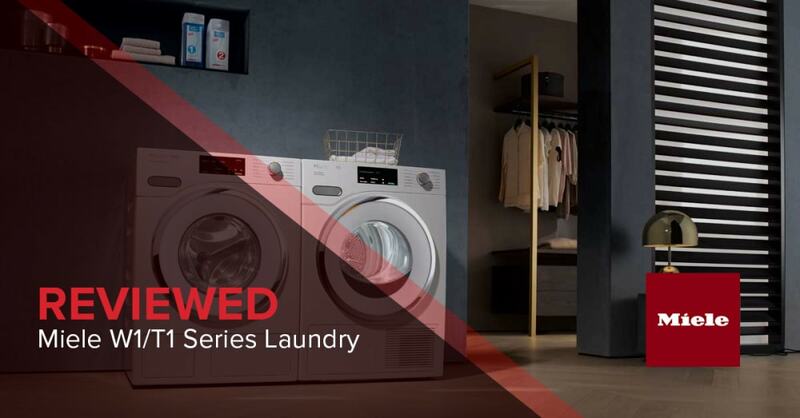 The new Miele product line of washers and dryers continues the Miele tradition of offering everything users want and need most, plus some surprising and intuitive features that leave other brands in the dust. They’re the perfect entrant into the high-end appliance market of 2019. We’ve done the research on the best apartment size washer and dryers. We’ve outlined the details that you should consider before buying an apartment size, compact washer and dryer in our comprehensive guide. Anytime Miele releases a new product line there are bound to be some questions and concerns from dedicated users and new converts alike. Here are a few frequently asked questions and their answers regarding the T1 and W1 lines. Do the T1 or W1 feature reversible door swing? The dryer door is reversible (can be configured as left or right hinge) however the washer door is not reversible. Currently, w1 washers are available with a left hinge. The electronics involved in the doors’ auto-lock feature prevents reversible door swing arrangement. I have an old Miele washer and dryer with 220V power. Do I need an electrician to install the new models? Nope! Miele offers a conversion adapter that you can simply plug directly from your new Miele plug into a standard wall outlet. Are hoses supplied by Miele? Both the washer and dryer come with an included 5’3” drain hose. It can be extended if necessary to 13’. The washer also comes with a 5’3” flexible intake hose with a ¾” GHT connection. Is there anything I should know before installation? Make sure that whoever installs your machine removes the shipping bolts inside. This is the number-one mistake installers make when setting up Miele machines. Do I need to ventilate my closet? Yes, it is always a good idea to allow air room to circulate. It’s best to leave closet doors open during laundry cycles, especially because lack of room for air to ventilate can lead to longer drying time. Which appliance goes to the top when stacking? We get this question a lot. When stacking your washer and dryer the dryer always goes on top of the washer. Again, both units are secured by a stacking kit. Does my Miele machine require maintenance? As long as it’s used according to its design, not really. Miele machines are designed to keep on working even after years of continuous use. I used to own a Bosch laundry where the washer plugged into the 220V Bosch dryer. I don't have a 110V outlet in my laundry closet. Do I need to call an electrician? No need to call your favorite electrician. Simply use the NEMA adapter sold by Miele in your wall outlet. What happens to Miele's W3048 Washer and T8033C Condenser Dryer? Where do I get the Miele@Mobile app and how do I connect the machines to Wifi? You can download the app from Apple AppStore. Mind you that you will need to be in the vicinity of your product and need to be able to entery your serial number (which you can find on the data plate -typically found on the door area- of your w1 washer). What if I don’t want to use the Wifi feature with these machines? Can I bypass this during setup? Yes. In the initial setup process it asks if you want to setup Miele@home "now" or "postpone". You can simply choose "postpone", but you have to go through the remaining setup prompts to complete the setup process, then the wifi prompt won’t come back. What functionality does the app currently have, or will have in the future? Currently, the Miele@mobile app allows you to see the cycle progress, time remaining, estimated completion time, and sends a notification when the laundry is ready. You can also stop some cycles remotely, before they have finished. Also, the app features Wash and Drying Assistants, which walks you through finding the perfect program and provides washing and drying tips. In the near future (Q1, 2019 est. ), you will be able to see the TwinDos Phase 1 and 2 detergent levels as well as some extra functionalities. Can I adjust the TwinDos levels being dispensed? Yes. The machines are set from the factory but can be adjusted. In some cases, depending on water hardness levels, or if small/single item loads are run, you may encounter more or less sudsing. The machines use low amounts of water, so some suds may remain along the bottom inside door or gasket, which is normal. You can adjust the detergent levels by turning the dial to More Programs. Than Settings, TwinDos, Change dosage, Ultra phase 1, Set the dosage, then adjusting Up/Down arrows. We suggest changing in small increments, until the desired result is achieved. Can I stack the units, on top of the optional pedestal accessory? No. This is not recommended. For one the stacked washer and dryer will be too high for controls. In addition, we do not recommend raising the center of gravity of your washer and dryer set. Does the condensate container need to be used? No. There is a flexible tube in the back of the machine that can be piped out to the drain in your laundry room, if you prefer. How do I know which cycle is optimal for the type of laundry I’m washing, and the size of the load? The washer is preset with many wash programs with optimal default parameters such as Temperature and Spin Speed. However, you can adjust the parameters with the Up/Down arrows on the touch screen, and additional programs can be accessed by turning the dial to More Programs. For an overview of choosing the optimal program based on fabric type, load size, etc. please see the Program Guide matrix in the Quick Start Guide which comes with your laundry. I’ve experienced occasionally, with single items or small loads, the clothes were really wet. Why? This may happen occasionally with front loader machines, as they may detect an imbalance. First, make sure the machine is leveled properly. Next, select the appropriate program and spin speed (reference the Quick Start Guide). It sometimes helps to add another item to the drum to avoid an imbalance. Regarding capacity, how do I know when the drum is full? The washer is rated for 17.6 lbs. of laundry. The drum can be filled to the top, but shouldn’t be packed too densely where you are pushing to get more items in. What is the best way to reduce wrinkles in the dryer? The amount of wrinkles varies depending on the fabrics, load size and drying level, so ensure the proper program is selected. (see Quick Start Guide program matrix in your documentation). Other suggestions include; removing clothes from the dryer and fold/hang immediately after cycle has completed. Another option is to run a SoftSteam cycle to help relax the creases. Why is the expected drying time shown in the display for Normal Cycle shorter than the Express Cycle? The T1 Dryer shows an average time based on your cumulative drying cycles. Each drying program builds its history independently, so the Express Program will still be shorter than the Normal Program although the time shown is different. How do I get the best drying results for my linens (bedding, table cloths, curtains, etc)? There are dedicated programs for large items like linens, which uses special drum rhythms to keep large items from balling up. Use either the Pillows or one of the Linens Programs found under "More Programs", and set drying setting to "Extra Dry". How do I keep my dryer at peak performance ensuring optimal drying times? Make sure you clean the plinth filter, located in the lower left door. Remove the filter, and wash off the accumulated dust, let dry and reinstall. The machine will also prompt you when it needs to be cleaned. Depending on usage, it may need to be cleaned every couple weeks, or less frequently. Going back to basics just make sure the correct program is chosen for optimal results. Please reference the Program matrix in the Quick Start Guide. Can you use your own detergent instead of TwinDos? Yes. Simply turn off the TwinDos option on the control panel, so it goes from illuminated to dim. Important to note: Powder detergent cannot be used in the pre-wash compartment, only liquids. You can use any detergent in the detergent drawer section. How many cycles do the Phase 1 and 2 typically last? 47+ loads for Phase 1, Phase 2 is used in smaller quantities so it will last longer. This is highly dependent also on the amount of cycles, and for example, running many small loads or SingleWash programs will make the detergents last longer. Is the TwinDos system suitable for allergy sufferers? Is it hypoallergenic? There are no tests performed on the suitability of UltraPhase 1 and 2 for allergy sufferers, and the products have not been formulated specifically with this in mind. The focus was on cleaning performance. Information on ingredients is provided by the labeling on the packaging. Allergy sensitive consumers can always use a detergent of their choice in the detergent drawer. Look for a hypoallergenic TwinDos detergent solution coming later in 2019. When not in use for a longer period of time (>2 months), it is recommended to run the TwinDos Maintenance program (the machine will also remind you). This is to keep the pipework performing optimally. It’s also recommended to run this program if going away for long periods of time (such as for vacation homes that see periodic use). How does the heat pump technology work? What are the main benefits of heat pump vs conventional dryers? Reduces energy usage and operating costs up to 60%. Energy Star Most Efficient rated. Connection / installation flexibility via 120 V 15 AMP, can be installed anywhere. Comfort: Air circuit doesn’t exhaust hot, moist air, keeping the room cool and comfortable. Quiet: The air circuit reuses the air, without the need for external ducting, reducing noise. Protects clothes and fabrics: Since the heat-pump dryer actively heats and cools the air circulating through the drum, it can achieve quick and uniform drying without relying on high temperatures. Traditional dryers have to heat ambient air to high temperatures to reach similar results. Fast cycle times: Conventional dryers require longer cool-down periods. Heat pump drying times are comparable to condenser dryers, as low as 32 minutes with small loads. Also worth noting is condenser dryers become less efficient as they rely on cool air drawn in from the room to cool the condenser unit.